Call: Rivers Edge Music/Electric Sun Productions @ 201-218 0746. Electricsun@earthlink.net --- (also available on itunes.com and CD Baby.com search artist Cliff Adam or cd "Woodstock Creative Magic"
Featured Songs: Cowboy,Time when we were young,Lonley One,Yes i love you,Greeneyed Lady (from the moon),Crystal Ship,Fashion Model Dream,Hard these days,I'll Be There,Raven and Banana. We screen thousands of songs by indie artists and name the best artists RadioIndy.com Gold Artists. We focus on musicianship, songwriting and recording quality when determining your Gold artist status. Congratulations - You are a Radioindy Gold Artist! 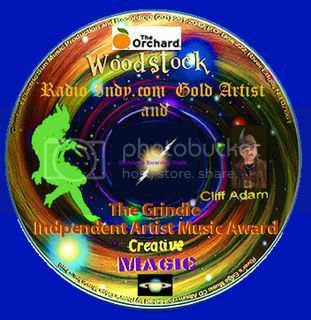 RadioIndy - is pleased to present Cliff Adam with a GrIndie Award for his CD "Woodstock Creative Magic"! This terrific cd collection has a song for everyone of all ages. While each song has its own unique style, mood, and sound, they all share one surefire quality.....and that is AWESOME! The melodies are beautiful, the vocalization is sincere and soulful, and each piece tells a tale that we can all relate to. We'll see you at the top of the charts! Review of "Woodstock Creative Magic" by Xavier P. and RadioIndy.com! �Woodstock Creative Magic� by the skillful Cliff Adam is an eclectic collection of country/pop tunes. Cliff�s songwriting takes the center stage on this CD, with meaningful, thought-out lyrics, and hook-filled songs. Each song on this CD acts almost as separate entities, creating a unique life of its own. The music is solid and Cliff's vocals take on a variety of different styles. �I�ll Be There� fits best into the easy-listening genre and demonstrates Cliff�s passionate, Elvis-esque vocal tone. �Fashion Model Dream� incorporates beautiful string arrangements and tells the story of a little girl with a big dream. Creative production elements, such as the animal sounds on �Crystal Ship,� make these songs extra special. Fans of Elvis Presley, Tim McGraw, and even Elton John will find songs that they can relate to on this delightful collection!